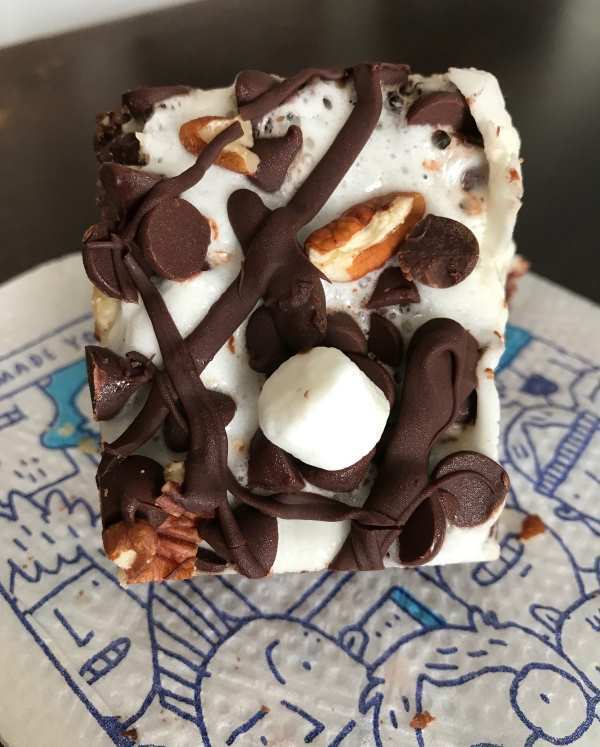 I didn’t have time to bake from scratch this morning, so I took advantage of some boxed mix and made these brownie mix Rocky Road Brownies. I wasn’t expecting them to be that great, but they were delicious. Or maybe I was just craving that instant brownie mix flavor of my youth? If you have some brownie mix on hand, this a good recipe. If you have a little more time, Martha Stewart’s got a similar Rocky Road Brownie from scratch. Update: It’s been a while since I posted this. Since then I’ve made (at least) dozens of different scratch brownies, but I still like these doctored brownie mix brownies. The not-too-rich brownie mix base is the perfect foil for the gooey topping. 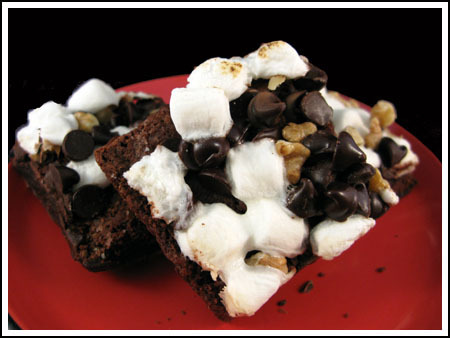 Convenient brownie mix based rocky road brownies can be made with any brand of brownie mix. 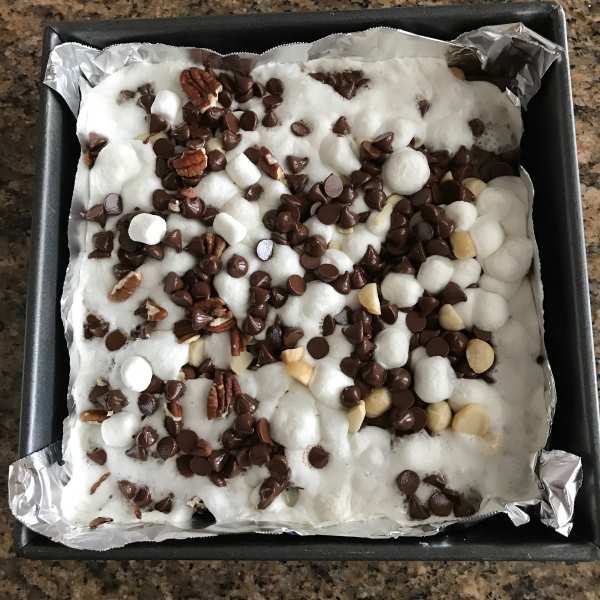 All you do is take the brownies out a little early, cover with marshmallows, chips and nuts, bake for 5 more minutes, then let cool. Prepare and bake the brownie mix as directed on the package. 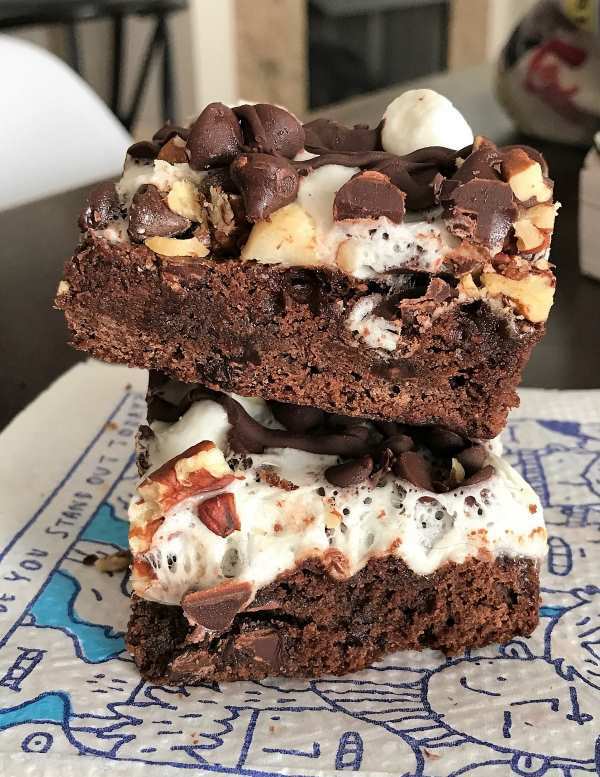 While brownies bake, mix together the marshmallows, nuts and a little less than a cup of the chocolate chips (you’ll be saving some for the end). About 5 minutes before the brownies are supposed to be done, sprinkle marshmallow mixture over the top. Return to oven and bake for 5 minutes or until marshmallows puff up. Remove from oven. Sprinkle remaining chocolate chips over top of hot brownies and if you’d like, Sprinkle on some more walnuts so that everything appears balanced. Let cool at room temperature for about an hour. Transfer to the refrigerator for another hour to set the chips. Lift the brownies from the pan and cut into squares. **The marshmallows get puffy and melt, but they don’t really brown after 5 minutes. It’s important not to keep the brownies in the oven too long because you don’t want to overcook them. If you really want brown marshmallows you can throw them under the broiler for about a minute after the 5 minutes of oven cooking. My kids happened to be looking at my computer when I went to this dessert. They are now insisting I make it. I DO have all the ingredients and they are elated! Thanks! yum and wow looking! must try them this holiday season! They look great! Nothing wrong with boxed brownies! These look delicious! My husband’s favorite ice cream is Rocky Road, so we’ll have to try these for sure! These look sinful – love the idea. I still haven’t tried that recipe, but everyone who has says it’s great. Next time I have brownie mix on hand, I’ll try the Symphony Brownies. These look awesome, Anna. I think brownie mixes are one of the better convenience items available. I had to work on Thanksgiving night, and the nurses brought in a huge variety of desserts. My favorite one was Symphony Brownies. They were made with a brownie mix. Half the batter goes into the pan, which is then covered by whole Symphony bars. The candy bars are covered over with the rest of the batter. That crunch in the middle of the gooey brownies was just right! I googled them, and it seems that Paula Dean made them for one of her shows.